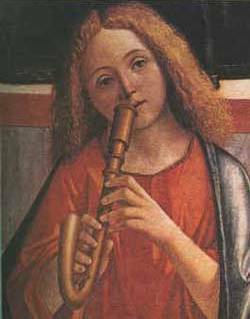 To modern ears, the most distinctive musical wind sound of the renaissance is the crumhorn, the J shaped wind cap instrument of the 15th–17th centuries. So unusual is its sound today that it was used in a Dr. Who serial to help create an unfamiliar soundscape (Doctor Who and the Silurians, 1970). In the renaissance, however, it was associated with the royal court, with ceremonial occasions and religious worship. This article briefly traces its history, and its perhaps surprising link with the bagpipes. With three accompanying videos: a crumhorn / lute pairing; the sound of the crumhorn’s probable predecessor, the bladder pipe; and a pavan played by a crumhorn consort.